Hokkaido offers many boating opportunities at the plentiful lakes, rivers and coastlines that bless the island. The ferry rides at Lake Toya, Lake Shikotsu, Lake Onuma and Lake Akan are a relaxing way to take in spectacular volcanic scenery. 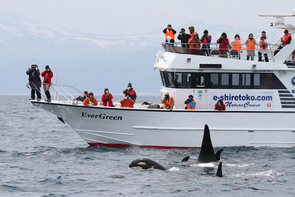 Nature cruises at the Sea of Okhotsk and Tsugaru Strait are remarkable for their wildlife viewing, and can include dolphin and whale-watching, birding and more. 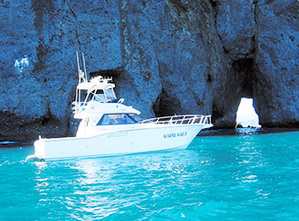 There are also charter services available for private tours around remote coastline regions. 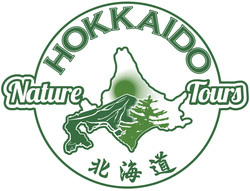 With the abundant marine life of the Sea of Okhotsk, wildlife enthusiasts come to Hokkaido with great hope of spotting dolphins, killer whales, all manners of birds, seals and sea otters. It is possible to see these marine creatures from the beginning of May to November. Top locations for springtime nature and wildlife cruises are in eastern Hokkaido, specifically Abashiri, Rausu and Nemuro, which offer 30 minute to half-day boating excursions to see local marine wildlife. There are many wonderful volcanic lakes in Hokkaido, the largest of which offer scenic ferry cruises from 30 to 80 minutes in duration. See the gorgeous mountainous and volcanic scenery from the comfort of a ferry. 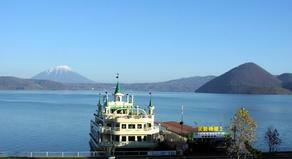 Popular volcanic lakes for ferry cruises are Lake Toya, Lake Shikotsu, Lake Onuma and Lake Akan. Chartering a vessel is a great way to explore remote coastline areas and gain access to unique fishing grounds. Popular destinations include Shakotan Peninsula and the Sea of Japan coast for fishing tours. Sunset cruises in the Ishikari Bay are a memorable way to end a magical Hokkaido day. The most popularly used inter-island ferry service is from Wakkanai, in the far north, to the nearby islands of Rishiri and Rebun. Not only are the ferry rides fun, but both islands are remarkably beautiful. Of course, we at HNT run nature tours in this region. Hokkaido is well-connected to other parts of Japan via ferry links. There are daytime and overnight ferries with various ticket classes, and they carry passenger vehicles as well. The most popular destinations are Tokyo, Kyoto Prefecture, Aomori Prefecture, Akita and Sendai. 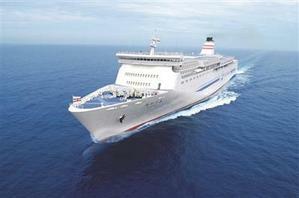 There is an international ferry line from Wakkanai to Sakhalin, Russia. The 4-5 hour ferry transports passengers and vehicles across the La Perouse Strait to Korsakov, which feels and looks like another planet altogether.